Le film suit la vie de plusieurs personnages qui essaient de se trouver dans un monde d’intrigues politiques, de vengeance, d’amour et de nostalgie de succès sur fond d’activité illégale mais néanmoins prospère de « veve » (de l’herbe). 2014 | 25ème session des Journées Cinématographiques de Carthage (JCC 2014) |du 29 novembre au 6 décembre 2014, à Tunis. The film revolves around four people who are interconnected by love triangles and business entanglements. Amos Munene (Lowry Odhiambo) is an ambitious MP in Meru who seeks to rise to the pinnacle of power in the country. Kenzo (Emo Rugene) is a young thug who is out to seek revenge against Amos for an unforgivable evil he committed in the past. Esther (Lizz Njagah) is Lowry’s wife. She crosses paths with Kenzo and ends up igniting a romantic flame that reveals the true nature of her husband. Sammy (Conrad Makeni) is Lowry’s faithful handy man, a cog in Lowry’s political scheming, who is struggling to build a new life after the death of his wife. 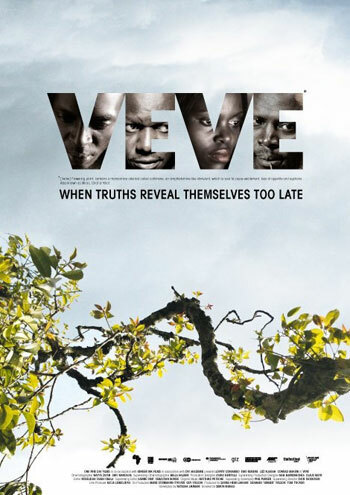 Veve begins on a slightly sketchy note as it introduces its characters one by one. But as soon as the relationships between the characters are defined, the movie acquires a bundle of explosive energy that boils down to a delightful mix of mind games and thrilling action sequences. The movies integration of miraa politics in the storyline is worth a thumbs-up and moreover its realistic depiction of rural traditions when handling communal business. Conrad’s performance as Sammy won the applause of the audience as he emulated a typically bossy right wing man with little regard for social status? Feature film produced by One Fine Day Films & Ginger Ink.